This parish - no. 49 in the above map - is located in Langbourn Ward. The church dates from before the Great Fire, and was rebuilt by Hawksmoor 1716-26, no marriages solemnised. London Metropolitan Archive holdings for St Mary Woolnoth. You can also perform a more selective search for churches in the St Mary Woolnoth area or see them printed on a map. Lothbury and Woolnoth - histories of the combined parish of St Margaret Lothbury and St Mary Woolnoth from the parish website. Church of St Mary Woolnoth - entry in the National Heritage List for England. Online Parish Register Images and Indexes for St Mary Woolnoth parish are provided by, or at various subscription sites via, the LDS FamilySearch wiki. No non-Church of England denominations have been identified for St Mary Woolnoth with St Mary Woolchurch Haw [LDS FamilySearch Wiki]. Wikipedia page on St Mary Woolnoth. World Heritage Encycyclopedia page on St Mary Woolnoth. Ask for a calculation of the distance from St Mary Woolnoth to another place. 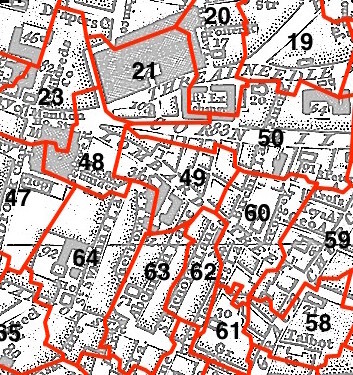 You can see the administrative areas in which St Mary Woolnoth has been placed at times in the past. Select one to see a link to a map of that particular area. Summary history of St Mary Woolnoth parish, from the Worshipful Company of Parish Clerks. Public Houses, Inns & Taverns of the parish of St Mary Woolnoth - provides "information from census records, trade directories, etc." Plans of the Parish of St Mary Woolnoth in 1831 and 1837 from COLLAGE, the London Picture Archive. 1900 map of St Mary Woolnoth - illustration of the location covered, and of archive(s) holding a copy, provided by the Catalogue of British Town Maps. Surnames from the 1881 census in the S t Mary Woolnoth and St Mary Woolnoth London districts. Clerical career summaries for the parish of (i) St Mary Woolnoth and (ii) St Mary Woolnoth With St Mary Woolchurch Haw, from the Clergy of the Church of England Database website. Sources for listings of taxpayer names for St Mary Woolnoth parish, listed on the LDS FamilySearch wiki.